Many (if not most) technical professionals are ineffective writers. That fact is widely acknowledged. The question is does anyone really care? I don't see A/E firms investing much in helping their staff become more proficient writers. Perhaps they haven't considered the costs of poor writing: Lost proposals, weak marketing, unapproved solutions, project mistakes, client claims, interoffice conflict, lost productivity—to name a few. I have seen all of these over the years as a result of poorly written proposals, reports, contracts, policies, correspondence, emails, or procedures. On the flip side, strong writing can yield substantial business benefits. I'm hardly a distinguished writer, but I've compiled a 75% proposal win rate over the last 20 years, producing more than $300 million in fees. I helped my previous employer generate millions of dollars in new business that started with prospective clients contacting us because of something we'd written. I wrote letters to regulatory agencies making the case for regulatory exceptions that allowed innovative solutions saving our clients over $18 million. 1. Purpose Driven: Define the Desired Result. As Yogi Berra famously quipped, "If you don't know where you're going, you'll end up somewhere else." Technical professionals often jump right into writing without much planning, or a clear understanding of what it is they're trying to accomplish. Everything you write has a purpose, but the chances are you don't really think about it. You just start writing because you have something to say. Yet simply communicating your message often falls short of getting the result you want. Power Writing demands a plan, what it is you want to achieve and how that will be facilitated through your writing. At the most basic level, you are typically seeking to do one of three things—inform, instruct, or influence. Each of these broad objectives calls for a different approach to writing. When you're not clear on your purpose, you're more likely to write a proposal that reads like a technical report. Or a report that has no clear objective. Or a work process description that seems to ignore the needs of the people following it. Once you have your purpose identified, the next step is to determine your Key Messages. These are the 3-5 things that you absolutely must communicate effectively to achieve your purpose. For each Key Message, you then want to define the supporting points that are needed to clarify and validate your point. This process results in a detailed content outline that will guide your writing. 2. Reader Focused: Facilitate Message Reception. Achieving your purpose is ultimately dependent upon your readers. It takes two to have successful communication. I liken it to a forward pass in football. The quarterback must deliver the ball on target, but the receiver has to catch it. If you're like most, your focus as a writer is on making the pass. But you need to give equal attention to making sure it is received. A good example of this is email. 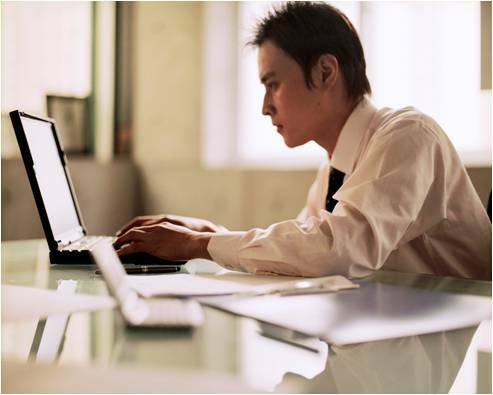 If you send an email to a client or colleague, you may feel you did your job. But if the recipient doesn't read it or misunderstands it, don't you share some responsibility for that outcome? 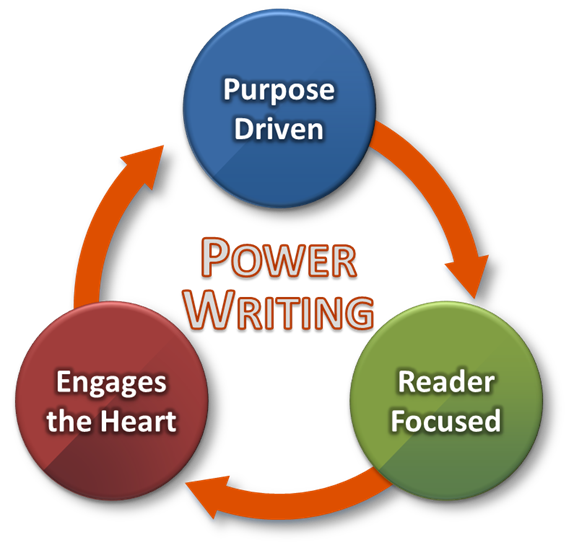 Power Writing isn't just sending out the equivalent of perfect spirals, but delivering it in a way that makes it more catchable. That happens in several ways. Foremost, you need to try to see the issue from your readers' perspective. Then they'll be more interested in what you have to say. A common disconnect in our industry is approaching a project from a purely technical perspective when the client is more concerned with the business or stakeholder implications. You won't likely accomplish your purpose in writing unless it aligns in some way with what your readers want or value. Reader-focused writing also means making it user friendly. One of the best ways to do this is to convey your message as efficiently as possible. Did you know it takes the average adult about one hour to read 35 pages of text? You should write with the expectation that it won't be read word for word (yes, even your emails). Make your main points skimmable. Make effective use of graphics. Use words everyone understands. Write in a conversational tone that easily connects. 3. Engages the Heart: Move Your Readers to Act. Of course, not everything you write is intended to spur your readers to action. But the most important writing you do is when you want to influence a particular response. It's unfortunate, then, that technical professionals struggle so much with persuasive writing. A big part of the problem is that they have been taught to write in a manner that is fundamentally nonpersuasive. Technical writing is by nature intellectual, objective, impersonal, and features-laden. This style of writing—which pervades our profession—avoids personal language, keeps opinions to ourselves, provides more detail than the audience needs, and buries the main selling points in information overload. It may suffice when writing a study report, technical paper, or O&M manual. But it is entirely the wrong approach when you want to persuade clients, regulators, the public, or employees. To move your readers to act, you need to engage the heart. That's because persuasion is driven by emotion and supported by logic—not the other way around. It is the human spirit that influences and inspires, and there is precious little of it evident in most of the writing we see in our industry. If you want to be more persuasive, let me suggest you start by dispatching the "technicalese" in favor of acknowledging in your writing the humanity in both you and your audience. I think the power of writing has been grossly undervalued in the A/E industry. 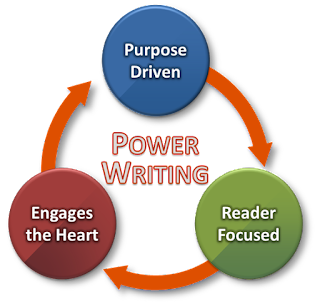 So I want to devote the next few posts to explaining in more detail how to become a Power Writer. Are You Close Enough to the End Result?